When your loved one needs care, it can be difficult to know how to proceed. Many people will ignore the issue or attempt band-aid solutions that just make things worse. For instance, busy people will try to split their precious time between their children and their own parents. They want to save money, but they end up paying the price in exhaustion and emotional problems. Sometimes, the cost can be even steeper when amateur care results in falls and other serious health issues. When your loved one needs help, it’s important to know what your options are. Many times, this basic level of clarity can make all the difference. You can have constructive conversations and explore possibilities with your loved one instead of stressing out and feeling trapped. There’s no reason to feel like you’re stuck when there are so many ways to improve life! However, all the options available to you are not created equal. 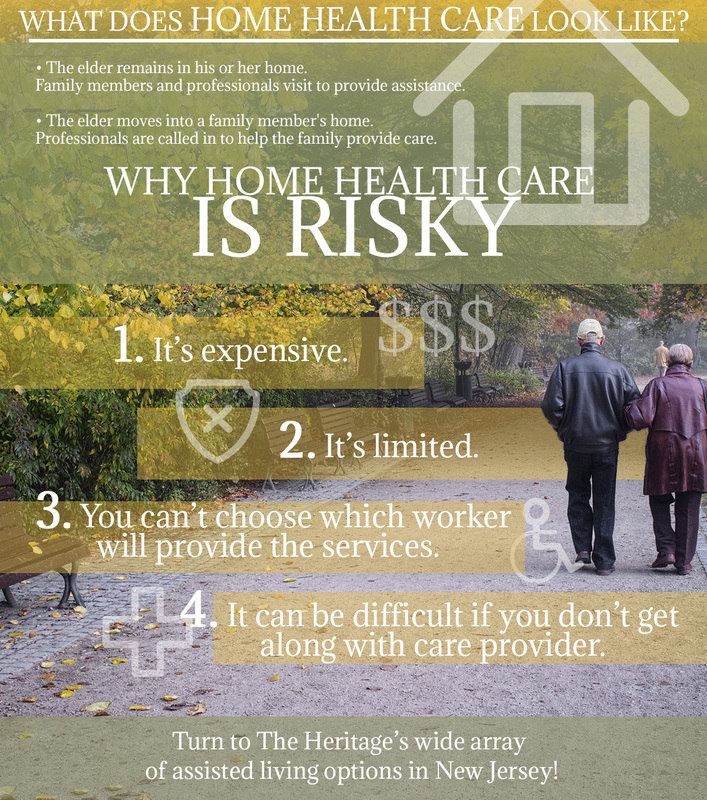 In today’s blog, we want to talk about home care and why it can be more trouble than it is worth. On a basic level, there are two main types of elder care available to you. One type is family-provided and the other is professionally-provided. Within these types, there are multiple options, which means it’s a lot easier to find a solution that works for your unique situation. While the team at The Heritage knows that everyone has different needs, we want to highlight the ways that family-provided care can create more difficulties instead of improving the situation. The elder remains in his or her home and family members visit or move in to provide assistance. The elder moves into a family member’s home for care. In both family-provided care situations, things usually go best when professional help is included. This can take very many forms. It can be something as simple as a housekeeper or chore worker who comes in to help with laundry, cooking, cleaning, yard work, and errands. It can get more involved to the level of providing personal care services like dressing or bathing. The third and highest form of professional support involves a certified health aide from an agency. You may think that, with the help of a professional, you can keep your loved one’s bases covered and save money, too. However, it’s not that simple. Home care agencies tend to be very expensive and not as flexible as you might need them to be when it comes to hours and duties. You may need someone who can help with both meals and medical care, but an agency worker will likely only cover the medical side. Lastly, agency care can be challenging because you and your loved one usually don’t get to choose which worker will provide the services. This can be universally unpleasant if your loved one and the care provider don’t get along. Your loved one’s life cannot be sliced up into sections that are each cared for by different people. This is an expensive and exhausting way to go about maintaining your loved one’s quality of life. Instead, check out our assisted living facility. We can provide a wide array of care levels in a positive, independent community. Contact us in New Jersey today!